We now offer the most advanced “bladeless” no-cut LASIK. Using the Alcon® WaveLight® FS200 Femtosecond laser, this breakthrough technology eliminates the conventional, mechanical microkeratome cuts altogether. 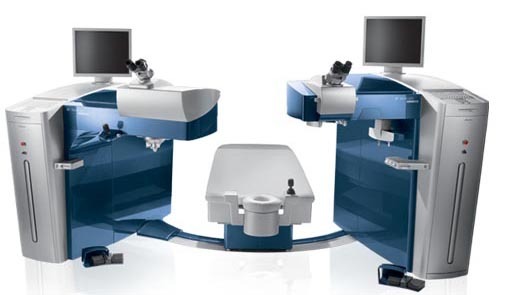 This, combined with the Alcon® WaveLight® EX500 Laser creates an all-laser procedure that is performed with elegant, computerized precision, resulting in faster recovery and more accurate vision with minimal complications. The Femtosecond laser uses customized, computer guided ultra-short light pulses to achieve the highest degree of corneal flap precision. Level, parallel cornea segments are created with uniform thickness throughout the flap. This gives the entire corneal flap more stability. The flap can be folded back and forth easily, and it attaches smoothly. The second step incorporates an excimer laser to gently reshape the cornea, adjusting its focusing power. The flap is folded back and adheres tightly to the eye. The results of this premium, “bladeless” procedure are incomparable in terms of precision, accuracy and predictability with minimal complications. Alcon, the global leader in eye care, selected our center to be one of the first ten in the United States, and one of the only ones in NYC to receive the new “bladeless” Femtosecond laser. WHY CHOOSE “BLADELESS” FEMTOSECOND LASIK?